With much fanfare, U.S. President Donald Trump cast his support for legislation that would make U.S. immigration system into a merit-based immigration system followed by reducing legal immigration. 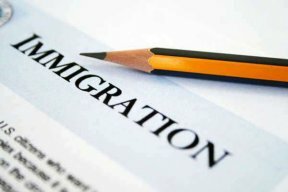 The legislation, known as the RAISE Act, was introduced by Republican senators Tom Cotton (Arkansas) and David Purdue (Georgia). The first part of the legislation, to bring in people with skills and knowledge needed for the American economy is not a problem to me. Both Australia and Canada do this. In fact, many countries do this—it is a given. The parts that I firmly object to is cutting legal immigration in half, reducing the total number of refugees to no more than 50,000 a year, and getting rid of the visa diversity lottery. This is BAD NEWS. To make things a whole lot worse this legislation would require that prospective immigrants know fluent English before they come to the United States. Australia and Canada do NOT do this. Their immigration process does not restrict family-related sponsorship for loved ones such as spouses, adopted children, and close relatives (family members such as sisters, brothers, and parents). The RAISE Act would do this, and therefore be discriminatory towards ethnic and racial minorities. On top of this, a requirement for having “fluent” English is racist to the core. This legislation approved was by White House staff personnel Stephen Miller and Steve Bannon. At this point, this legislation has no other supporters among Democrats and Republicans in the U.S. Congress, and it is likely that this legislation will be left to die. Even leading Latino conservatives like Alfonso Aguilar of the Latino Partnership for Conservative Principles has condemned this legislation. At this current rate, this legislation will never see the light of day. So why did President Trump put out such a major press review campaign for this? It is becoming obvious that he is looking for a major “win” in the U.S. Congress and trying to appeal to his base supporters who are extreme nativists and racists. But if the Republican-controlled Congress cannot agree on passing not-as-controversial legislation for health care reform, then how will they pass extremely controversial legislation for a major overhaul of the immigration system? Well, this legislation will certainly never be considered. Under this legislation, when you think about it. most of our ancestors would never have been allowed to come to this country. My grandparents, who spoke almost no English, would never have been allowed into the United States. My wife, who came from Korea, would probably have never been allowed into the United States. All I can say is that those who ever came up with this piece of legislation should go back, blow up their drawing boards, and really, really start over from scratch.